January was a tough month to analyze but there were some positives for the NHL reported attendance. First off, comparing January 2014 to 2013 is not really possible as we came out of the lockout last year and had opening night in January last year and the condensed schedule generated a little more buzz and excitement than your normal January NHL game. We also had 4 outdoor games in January this year which makes the comparison even more challenge. I attempt to navigate the numbers with these nuances in mind. 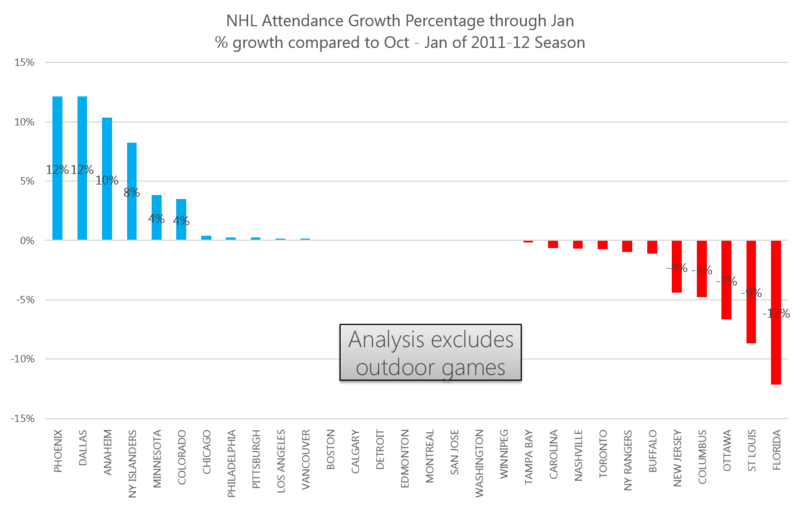 Most numbers and graphs exclude outdoor games. 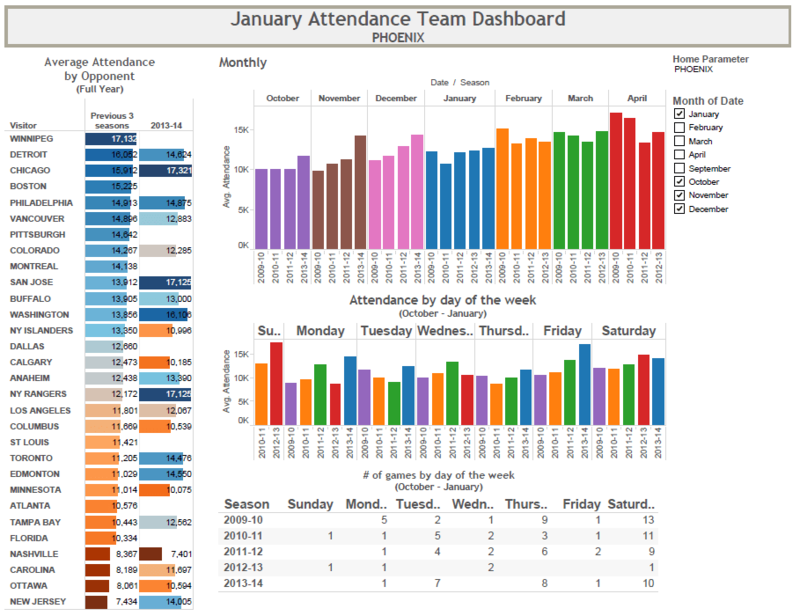 If you exclude the Outdoor games, attendance is down a bit for the month of January. If you peel back the onion a little bit, the two biggest arenas (Chicago & Montreal) in the league had two less game each compared to January of 2012 which could explain some of the 1.9 % dip after you exclude the outdoor games. Here is how each team has fared compared to the 2011-12 Season (the lockout shortened season of 2013 is not a good comparison). 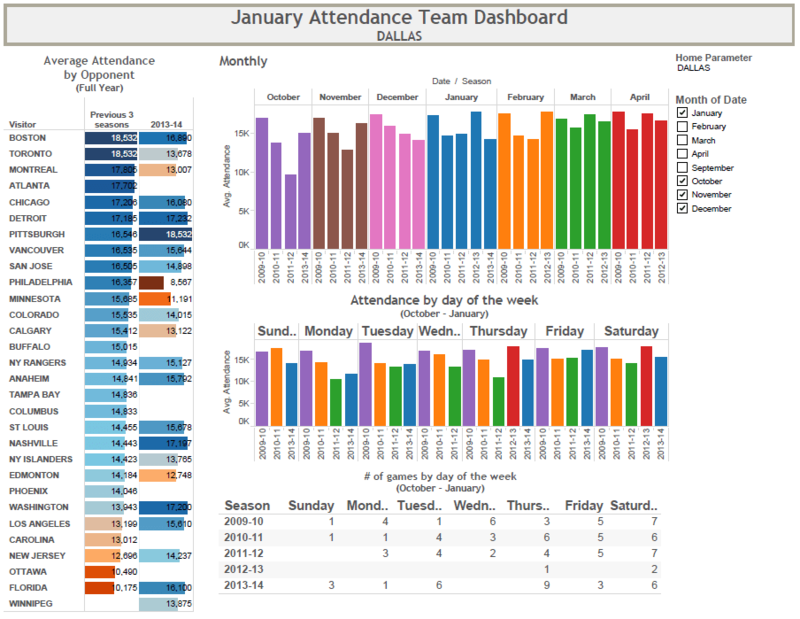 If you look at it by a team by team basis, January had 8 teams that had an increase & 8 teams that had a decrease in attendance compared to 2012. As you can see, the Coyotes continue their big gains in January and are now the biggest increase across the league. 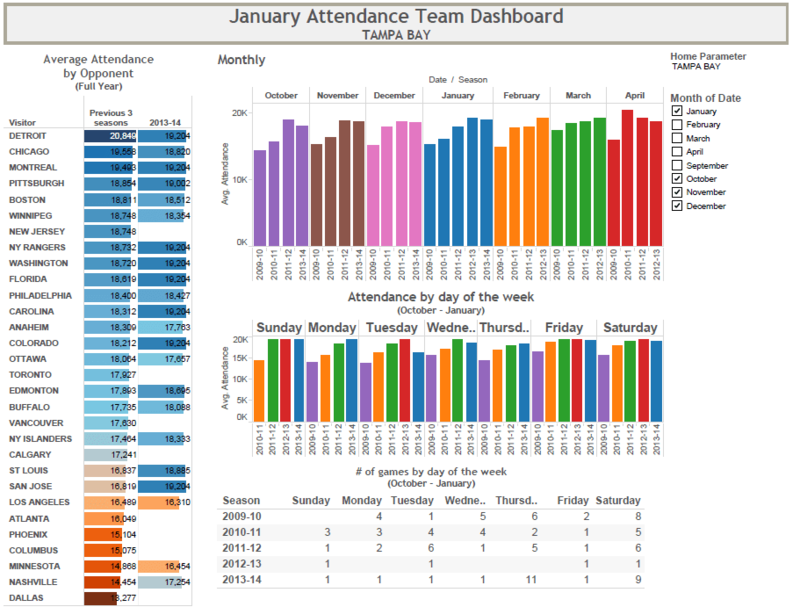 January was up only slightly from 2012 and most of their season games were made in the prior 3 months. 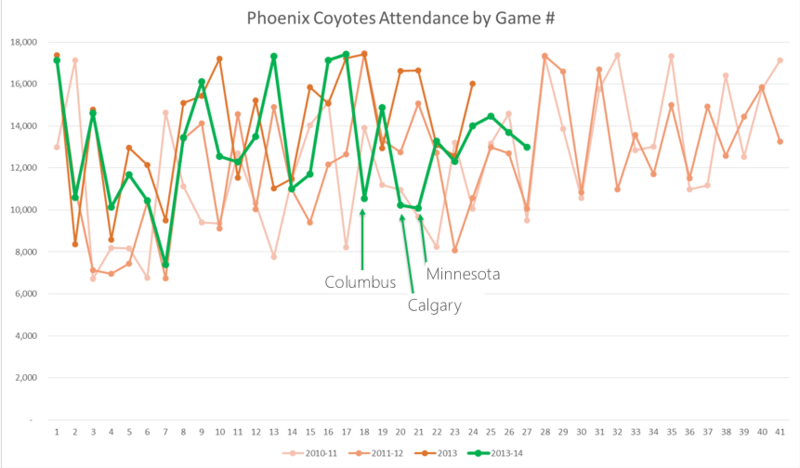 Haters be warned that with no remaining home games in February, the Coyotes will have their biggest average attendance for February in 5 years. Roughly a 15% increase compared to the prior two seasons. The recovery in Dallas appears to have taken a step back in January with a drop of 4% compared to January 2012. This could be some weather issues keeping fans at home or it could be a short blip in their recovery. They are still up 15% from 2011-12 season. Florida is definitely struggling at the gate. This is due to a perfect storm of ownership changes & struggles on the ice. Although Phoenix is turning around with new owners this year, Florida’s ownership change was several months later and didn’t allow the new owners to drive a lot of change this season. Similar to Dallas, I would expect a turnaround next season. 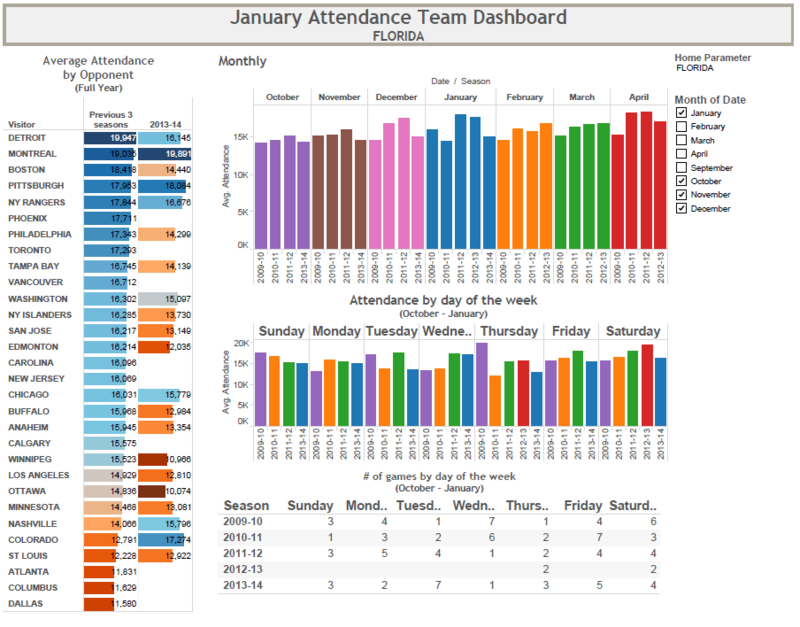 Per reader request, here is Tampa Bay’s Dashboard. The Lightning are flat compared to 2011-12 season but January was a big month up 6% compared to 2012. Also cool to see that they have averaged over 18K in each month this season. Dude, your dreaming if you think the Dallas Stars are a candidate for relocation. Where in the world do you get that from the post? I am pretty sure I didn’t even use the word relocation.